August 27, 2017 "Information Clearing House" - The following is a partial list of U.S. military interventions from 1890 to 2014. 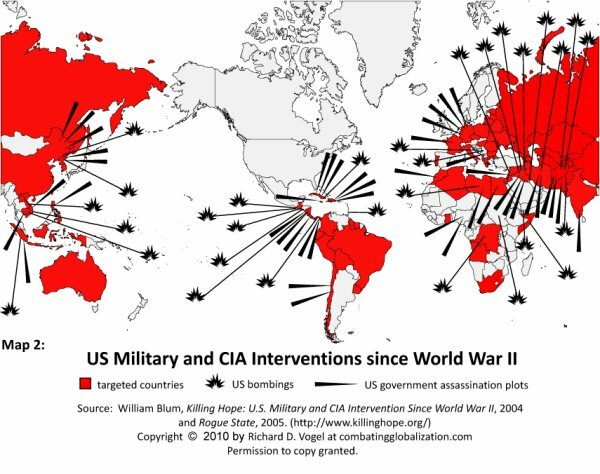 In addition to the list is a Briefing on the History of U.S. Military Interventions. Ellsberg in Protest & Survive. Versions of this list have been published on Zmag.org, Neravt.com, and numerous other websites. Turkish newspaper urges that the United States be listed in Guinness Book of World Records as the Country with the Most Foreign Interventions. NICARAGUA 1907 Troops 'Dollar Diplomacy' protectorate set up. PANAMA 1918-20 Troops 'Police duty' during unrest after elections. LEBANON 1958 Troops, naval Army & Marine occupation against rebels. CHINA 1958 Nuclear threat China told not to move on Taiwan isles. VIETNAM 1960-75 Troops, naval, bombing, nuclear threats Fought South Vietnam revolt & North Vietnam; one million killed in longest U.S. war; atomic bomb threats in 1968 and 1969. CUBA 1961 Command operation CIA-directed exile invasion fails. GERMANY 1961 Nuclear threat Alert during Berlin Wall crisis. CUBA 1962 Nuclear threat, naval Blockade during missile crisis; near-war with Soviet Union. PANAMA 1964 Troops Panamanians shot for urging canal's return. INDONESIA 1965 Command operation Million killed in CIA-assisted army coup. GUATEMALA 1966-67 Command operation Green Berets intervene against rebels. DETROIT 1967 Troops Army battles African Americans, 43 killed. UNITED STATES 1968 Troops After King is shot; over 21,000 soldiers in cities. CAMBODIA 1969-75 Bombing, troops, naval Up to 2 million killed in decade of bombing, starvation, and political chaos. OMAN 1970 Command operation U.S. directs Iranian marine invasion. LAOS 1971-73 Command operation, bombing U.S. directs South Vietnamese invasion;carpet-bombs"countryside." SOUTH DAKOTA 1973 Command operation Army directs Wounded Knee siege of Lakotas. CAMBODIA 1975 Troops, bombing Gassing of captured ship Mayagüez, 28 troops die when copter shot down. ANGOLA 1976-92 Command operation CIA assists South African-backed rebels. IRAN 1980 Troops, nuclear threat, aborted bombing Raid to rescue Embassy hostages; 8 troops die in copter-plane crash. Soviets warned not to get involved in revolution. LIBYA 1981 Naval jets Two Libyan jets shot down in maneuvers. EL SALVADOR 1981-92 Command operation, troops Advisors, overflights aid anti-rebel war, soldiers briefly involved in hostage clash. NICARAGUA 1981-90 Command operation, naval CIA directs exile (Contra) invasions, plants harbor mines against revolution. LEBANON 1982-84 Naval, bombing, troops Marines expel PLO and back Phalangists, Navy bombs and shells Muslim positions. 241 Marines killed when Shi'a rebel bombs barracks. GRENADA 1983-84 Troops, bombing Invasion four years after revolution. HONDURAS 1983-89 Troops Maneuvers help build bases near borders. IRAN 1984 Jets Two Iranian jets shot down over Persian Gulf. LIBYA 1986 Bombing, naval Air strikes to topple Qaddafi gov't. IRAN 1987-88 Naval, bombing US intervenes on side of Iraq in war, defending reflagged tankers and shooting down civilian jet. SUDAN 1998 Missiles Attack on pharmaceutical plant alleged to be 'terrorist' nerve gas plant. IRAQ 2003-11 Troops, naval, bombing, missiles Saddam regime toppled in Baghdad. More than 250,000 U.S. personnel participate in invasion. US and UK forces occupy country and battle Sunni and Shi'ite insurgencies. More than 160,000 troops and numerous private contractors carry out occupation and build large permanent bases. SOMALIA 2006-? Missiles, naval, troops, command operation Special Forces advise Ethiopian invasion that topples Islamist government; AC-130 strikes, Cruise missile attacks and helicopter raids against Islamist rebels; naval blockade against 'pirates' and insurgents. IRAQ 2014-? Bombing, missiles, troops, command operation Air strikes and Special Forces intervene against Islamic State insurgents; training Iraqi and Kurdish troops. SYRIA 2014-? Bombing, missiles, troops, command operation Air strikes and Special Forces intervene against Islamic State insurgents; training other Syrian insurgents. The map documents a partial list of occasions, since 1890, that US forces were used in a territory outside the US. It does not include threats of nuclear weapons against a territory, such as during the Berlin Air Lift (1948-49). It also excludes any time US military personnel were deployed to a foreign country for an exclusively humanitarian purpose – e.g. sending troops to the Democratic Republic of the Congo to provide assistance to refugees fleeing the Rwandan genocide (1996-97). On Monday, President Donald Trump announced that the US would be increasing the number of troops it had in Afghanistan. During the televised remarks from Fort Myer, Virginia the President did not allude to the specific numbers, but said the troops would be there to train members of the Afghan army. Despite withdrawal policies advocated by President Obama, and President Trump while he was campaigning, there remains a significant US military presence throughout the world. According to these figures from the US Department of Defense, the US had 199,005 members of its military on active duty at that time. When numbers were published for the June quarter, the UK was home to 8,126 active duty US soldiers. Moreover, there were zero active duty military in June, in the Central African Republic, Georgia, Iceland, Luxembourg, Macao, Montenegro, the island of Saint Pierre and Miquelon, and Swaziland.